Who benefits? Quite simply – everyone! But especially those who need to get around in Kent Thameside. Everyone will benefit if local trips that would otherwise be made by car are transferred to Fastrack. Unless this happens traffic congestion will continue to grow right across Kent Thameside and everyone will be affected, wherever you live locally. By using an attractive, affordable public transport system as the transport mode of first choice, local car trips will be minimised and Fastrack will help to enhance the quality of life for everyone who lives, works in or visits the area. Fastrack is therefore the ideal solution for Kent Thameside. Typical car occupancy in Kent Thameside is one or two people. 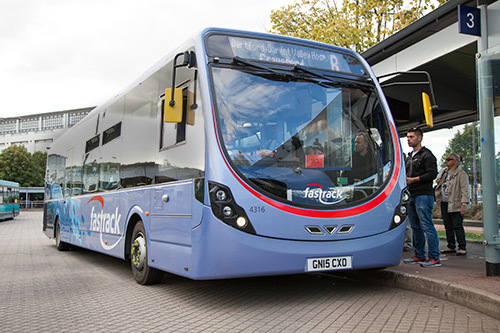 A Fastrack vehicle can carry 75 people. The potential for reducing the number of vehicles using local roads is clear. Much of Fastrack will be provided by developers regenerating and developing the major sites in Kent Thameside. But this does not mean that Fastrack will only be available for use by people living, working or visiting those new developments. 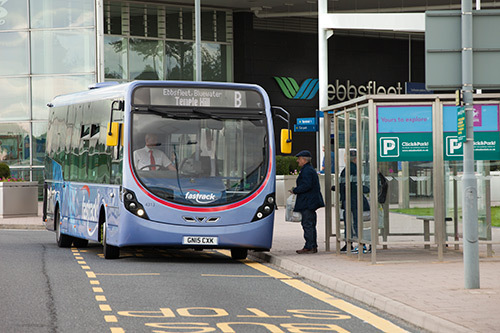 Fastrack positively helps to share out the benefits of regeneration and new development by linking new sites with town centres and transport interchanges and allowing people to easily get around Kent Thameside.